1 Chinese can buy more from you. That means for a single order. tariff exemption limited now is 5000RMB! For example: if you are selling something with a high valuation, like a luxury bag, You can directly sell to China online now. 2 Many of the new type of products allowed to sell online directly to China. Beer, fitness equipment, nursing electronics and many more others now allowed to sell directly to China. 3 Your biggest competitors “Cross-border buyer” has been confirmed is illegal. “Products purchased by cross-border e-commerce cannot be sold twice”. That means the Chinese cross-border buyers are illegal. Chinese customer will have to buy from platforms or your store directly. The Chinese government has clearly stated its attitude to support the development of cross-border e-commerce. Taobao.com is the earliest e-commerce platform in China. Actually, in China, Taobao is more famous than Tmall. Tmall and Taobao are completely interconnected. For example, when searching on Taobao.com, some products are from Tmall. Chinese people don’t really think they are separate websites. Tmall.com was founded in 2012 to counter JD.com’s rise, Tmall only allows brands that are part of a China-registered company to join. But for taobao.com, anyone can join. The Tmall international’s domain name is Tmall.hk (hk is for hong kong). But no one actually uses this domain name, most of the Chinese don’t even know there is a different domain name. They find Tmall international’s listings by searching on Taobao.com. So, Tmall and Tmall international rely on taobao.com, especially Tmall international. Adn actually, most of the traffic comes from taobao.com. According to the statistics, only 0.6% traffic comes from users actively entering Tmall.hk (and I really think those people just the store owners). So basically, either people search your brand name on Taobao.com, either they search your product keywords on Taobao and hopefully your listing is in the first results, only with these 2 ways you will have traffic and sales. At this stage in 2018, Tmall.com does not completely rely on taobao.com, because the Alibaba group is running massive marketing campaigns to promote it, like 11.11. Also, they are thousands of affiliate partners driving traffic to Tmall in order to earn commissions. So there are more and more Chinese shoppers entering Tmall with Tmall.com, and Tmall is still channeling traffic from Taobao searching. So Tmall.com has everything. 1. Joining Tmall international is a good start, but if you don’t do brand marketing or SEO, there will be no free traffic. 2. Joining Tmall.com is difficult for foreign companies, but it’s a long-term strategy if you want to succeed in China. Every Chinese who wants to sell can join Taobao at a cheap price, and for the store itself, it is very similar to a Tmall store. You can develop some dealers on Taobao.com, they know how to do marketing in China. You have the same searching benefit as Tmall, even more. After all, those are just the channels, the place to list your products. But a foreign brand should always focus on brand building and make sure that all the listing look professional. This is the most common strategy that works well in the Chinese E-commerce market. You guess how many SKU listings there are on the biggest stores such as Taobao or Tmall? One billion. If you simply list all your products on the platform, it has no reason to send the customers to you unless you have ‘something really good’ in your store. That really good something is the Hotcake. You will need to go over all of your products, find the one who has the potential to be a Hotcake. This product has an obvious advantage compared to your other products. You can bring its price down to the bottom. You have received lots of good feedback about this product on other markets. This product tells us who you are, what your brand is about. Make this product’s description exceptional, with videos, pictures, reviews from other customers. Run social ads, searching ads, platform ads for this product. You need to test this product on the real market. To speed up the delivery, you can ship the product to Wudi’s Shanghai warehouse, we will take care of everything for you. Monitor the conversion rate: You must make sure this product has a good conversion rate. If this is your best product and you are selling it at a very good price, if the conversion rate is low, there must be something wrong. Either your product does not fit the Chinese market, or you picked the wrong selling point. Invite Influencers, blog owners, Douyin big V, Weibo big V, Wechat official accounts who have a large number of subscribers to promote your product. In general, the social network traffic is cheaper than ads traffic, and your conversation rate has been proven in the last stage, so your orders will definitely skyrocket. Most importantly, your brand will appear in front of thousands of customers and they will see your Hotcake product. Call the customers who purchased this product, ask them for feedback and ask them to leave a 5-star review. I know you can’t do that, we will take care of that. Don’t forget to add some brochures with your brand intro to your package. Chinese consumers love surprises. If this stage is successful, your Hotcake product will have a great ranking on all platforms. That means that your store will have a lot of traffic. All your products will sell well, and this is how you make profits. This is also excellent for your brand reputation in the Chinese market. So that if you create your own website or APP in China, you will get orders right way without the need for marketing. *this is the general process . for you could be different. but the principle is the sample. Hotcake strategy is all about setting a low price to let mass consumers use your product and build trust and confidence in your brand and products. Let your products talk for themselves. 2. Call your CEO to speak on behalf of your product. That CEO speak for a company’s product is not news, it happens everywhere. But for E-commerce in China could mean more than that. You know that in China, there are many fake foreign brands. In some markets, there are some Chinese brands acting like they are foreign brands. They go to Europe, register or buy a small brand, then position their brand as a historical European brand. Why are they doing this? Because it works well. They make a lot of profit by relying on Europe’s reputation. So, as a foreign brand, you need to prove to everyone you are a foreign brand. Sounds ironic, right? Also, this is part of trust building. Take videos, get your CEO to speak some Chinese. Let your designers and engineers speak for your product, show your factories, show your quality control system, interview some real customers from other countries. Show us how you designed this product and how you care about your brand. Show us your special selling point, how your country and its culture affect your product. Try and find what distinguishes you from Chinese brands, and that is how you win the Chinese market. We pull all your items from your current online store (or ERP if applicable), then translate them to Chinese, then sync all the items to all the Chinese E-commerce platforms that you choose. This sounds easy but it is not. We need to do more than that. The AI-powered translate engine is better than Google translate because some Chinese characters for E-commerce can be different. Even in their meaning is the same, E-commerce has its own language in China. We manually set some translate rules based on your language and products to make it more local and easy to understand by Chinese consumers. We know that Tmall or JD is actually just like Amazon. But we still need to make sure your listing has the keywords and meta descriptions that match the platforms’ requirements. Tmall and JD have different rules. Our programmers will take care of it. That is how you get free traffic. 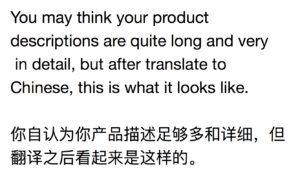 Most E-commerce product content is listed data, the AI translator will work fine. We need humans to match the specific attributes with the platform and make sure they are correct. For long sentences or paragraph, human editing is necessary. 3. Description template: The biggest difference between doing E-commerce in China and in Western countries is the product description. So many foreigners companies fail on this. Our designers manually make a description framework. Including brand introduction, shipping process, company information, policy etc. This will make your listing clear and trustworthy. Our program generates a specific product description for each item and make the images and content elegant, beautiful and attractive. So you see, we do not simply translate your items into Chinese, we make them look like professional E-commerce item listings that will be able to convert views into orders. 1. Overpriced products or targeting the wrong consumer group. After all, China is a developing country, Chinese consumers want good value for their money. Although there are some very wealthy Chinese consumers, most E-commerce sales are to the middle-class. China does not escape the rule. As it is in Western countries, bad pricing is a recipe for disaster. I know you did your research, most of the western brands are selling expensive products in China, they want to maximize their profits on each order (because the traffic is huge, but the conversion rate is low). And this has nothing to do with their products, but their strategy is offline first. Now we are talking about e-commerce first, right? The logic has changed, you want to decrease your profits on each order but increase the sales volume. Good design is perfect, but the design should be the reason why Chinese customers choose you, not pay more for your products. I have seen so many new E-commerce players make this mistake. They put an unbelievably high price tag a product, claiming it is a designer product that deserves high-margins. For E-commerce this is dangerous. I just used three paragraphs to tell you that you are too expensive? Yes. I want to say it again, your beautiful logo, long history, amazing design are the reasons why people choose you, not why they pay more. If you are selling clothing or shoes, you need to adapt the sizing of your products to the Chinese market. You might even need more sizes, look at Yaoming and Jack Ma. I raised this point in another article. I have found that a lot of brands put so much budget in marketing, hire expensive models, take very fancy photographs and videos, but the products descriptions are just too simple. To put it simply, if you wrote a whole novel for each product, it would sound reasonable to me. Chinese is a highly abstract language, even if your description looks long in English, it is not the case in Chinese. If your description is too simple or too short, shoppers won’t stay a long time on your listing, and human need time to make decisions. A description that is too short or too simple will affect your conversion rates. But do not worry, our translate system will add many extra descriptions for each of your products before we sync them to all the platforms. When purchasing a product from a foreign brand, more than half of Chinese consumers worry about the aftersale. You need to tell them that you handle the return, exchange, and refund. This is why we offer an aftersale service. Generally, if the price is ok, Chinese will still prefer a good foreign brand, but you need to show us that you have faith in your products. You need a Chinese model. Especially for the young generation of Chinese, they prefer Chinese models. A familiar face is more reassuring and we can easily imagine ourselves wearing your product. Additionally, we are not going to think that you are a fake foreign brand just because you are using Chinese models. A well picked Chinese name for your company is extremely important. You don’t have to put it on your label, but you need to mention it during the marketing campaigns. We don’t really remember English names so much. We are very superstitious, so choosing a proper name with positive Chinese characters is very delicate (you will need help from a Chinese person for this). 9. Learning from other Chinese sellers. Some foreign brands enter the Chinese market and try and copy a competitor in China. For example, by doing promotions too often, offering discounts that are too high, or do something unrelated to their brand, such as lottery, group buying etc. Those kinds of marketing techniques may work for Chinese brands, but maybe not for you. Don’t forget you are a foreign brand, you should play your own style and use your own strengths. Eventually, we prefer foreign brands because we want better quality. Since so many local Chinese brands have disappointed us again and again, we rely on foreign brands as a guarantee for good quality. 11. Hiring a foreign-owned Agency in China. I’m Chinese born and raised. I started to sell products on Taobao when I was in college. Do you really think the foreign-owned agencies can help you in China? Do they really know what the Chinese customers want? I am not surprised to see quite a lot of foreign brands join Tmall, JD and then fail. They all share a common trait, they hired a foreign-owned agency. Nathan is Co-Founder of Wudi technologies, he possesses 9 years of experience on E-commerce. There are two ways to sell to China. Cross-border and in-country. the biggest difference is if you have a warehouse and company in China. You don’t have a self-own warehouse in China, means you need shipping from overseas. and you don’t have a Chinese registered company, so you can’t join Tmall, JD mainland but only can join Tmall international and JD international. But this model is lean, save money as well. You can use it in the beginning. Wudi Offer you the temporary warehouse for returned and hot sell products. 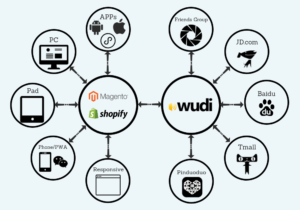 Wudi also helps you with customer service. those services gonna help you a lot at some point. Since you ensure your products are welcome in China, You should move to China, set up a Company here, and running like others Chinese e-commerce company. this model will bring your business to another level. this helps you make the real profit. Tmall: the NO1 E-commerce platform in China. It covers most of the Chinese online shoppers. JD: the NO2 E-commerce platform in China. It covers most of the Chinese middle-level online shoppers. NOTE: Same as Tmall, when I talk about JD, it means JD.com in China mainland, not JD international. Pinduoduo: recently launched, they’ve been an IPO company for only 3 years. They announced that their sales have surpassed those of JD. WeChat: WeChat is not an E-commerce platform but WeChat mini-programs have become extremely popular in China. Since everyone in China uses WeChat, it is a great place to market and sell your products. There are many other platforms & channels, I will not talk about them right here. There is nothing wrong in joining Tmall, but don’t expect too much. It is a channel that will get you a lot of traffic if your product does well. Otherwise, there will be no free traffic. Tmall’s traffic went down a little bit those years, it has been taken over by Pinduoduo and the WeChat Ecosystem. But you still need a Tmall store. JD positions itself as a high-quality goods marketspace, just like Amazon. They sell their own hosted goods and allow other brands to join as well. JD has a pretty good reputation in China. That makes it a fine channel to join. But JD doesn’t have so many methods to promote your store. You need to wait for JD to send you traffic. But who says this is not an advantage for a foreign brand? Anyway as a foreign brand, you are good at general marketing, not at on-platform marketing. Pinduoduo is the dark horse of the recent years, Pinduoduo vendors sell products for a very cheap price, but in huge quantities. They target the Chinese who live in small cities and the countryside. They don’t have so much income and are new to online shopping. If we put Taobao, Tmall, and JD users together, we reach a staggering 0.5 billion users. But the Chinese population is 1.4 billion. So there are still a lot of people (probably more than 0.5 billion) who are not shopping online yet. They are the next source of increase as China’s economy is still growing over 6%. Another big chance may be in front of you! If your company has a great supply chain that can bring your cost down, and you don’t mind positioning your brand as an affordable brand, Pinduoduo is definitely worth considering. WeChat is a real-time chatting software. But for Chinese consumers, it’s way more than that. With WeChat, you can reach all the Chinese internet users. That is the biggest advantage of WeChat. WeChat has official public Accounts, you can use this tool as your brand’s official channel where people can subscribe to your brand’s feed. WeChat also supports Mini APPs, where you can build your own store. Mini APPs just like Moblie APPs, but they run inside WeChat. Users can share Mini APPs easily and do not need to create an account, or input an address to start shopping from it. Additionally, because users can use their WeChat Account information and address, the payment can be made immediately without adding any extra information. So with WeChat Mini Apps, users can very easily get started. That is a great method to engage users or sell products. By the way, Pinduoduo has become very successful. 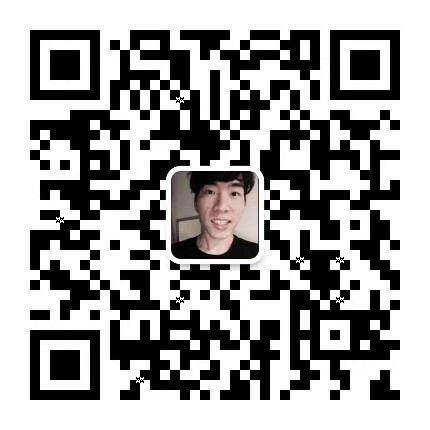 Wechat Mini APPs help a lot. People just share Pinduoduo’s Mini APP with each other. This is because Pinduoduo’s business model is “if you share my product with your friend, both of you have a discount”. If your main goal is the pure B2C, you still need it. If your customer wants to know more about your brand, they will still search your name on Baidu.com. But at this time in China, you don’t have to make it an E-commerce store. Just making it a normal promotion website is enough. Then link it to your other stores. But make sure the design is great. Later if your business is stable in China and has quite a lot of customers, then go back to upgrade your own store, even launch an APP. If your goal is to find distributors in China, or your E-commerce is more like a B2B model, you will need to pay more attention to it. Our Magento plan will be your favorite one. Magento has lots of powerful SEO features that can ensure that your web ranking is high on baidu.com (the Google of China). Make the right decision, do what you should do and trust your judgment. Get ahead of other brands. China is a fast moving market and nobody is always right. You may be the next dark horse. 1. Our system will collect orders from all the platforms and centralize them, then synchronize them back to your system, including return, refund, exchange. You will be able to see all the actions taken from the backend. So in the end, your order process will remain completely unchanged. 2. International logistic You need to find a logistics company who can ship the orders to China. There are many out there. 3. Depending on your product, Chinese customers may need to pay the customs fee, but don't worry, they know it. 4. If a customer needs return or exchange, they will go to us. We have a warehouse for this. Return & refund: return to our warehouse. We will check the returned item and keep it for you until it is purchased by another customer. * You send this new order again, we keep the old item. * If the old item is intact, we will sell it again. * Collect it and send it back to you. * Selling it as a defective product. We know China is the factory of the world. There are millions of OEM factories out here. Most of them have a dream, selling to the customers directly. When they came to us, they only had one goal: that their website actually brings them orders, not just sit there being fancy and gathering dust. How does that work? They have no brand, no channel, no marketing experience, they don’t even speak English. This is a difficult situation that forced us to perform very well with SEO and value every single visitor. We keep improving ourselves, from a pure development team to a full stack agency that mastered SEO, User Experience, and E-commerce strategies. We strive to put our clients’ stores at the top on search engines and optimize the conversion rate from the available traffic. We have been offering E-commerce services for 8 years now and still going. Hundreds of small startups have succeeded with us. As a Chinese background company, we know what we are good at it and we know what is the most important thing. Behavioral interest / Someone like game or sport. and what they have done recently. Age, gender, Education, Marriage status, Working status / Wechat know you more then yourself. New device user / You can remind someone changes a new phone. Equipment prices / Apple users may willing to pay more buy stuff. Networking method / If your ads are Video, you definitely need to choose 4G network. Mobile operators / Some business guy only like China mobile. Dressing index / Very useful for selling clothing. Meteorological / If you are selling an umbrella, you gonna need this. Temperature / China is big, summer or winter could happen at the same time in China. App installation / If someone happened installed an APP from your competitor, he may be is your client as well. Consumption status / If someone spent a lot of money on shopping, will you like him? Paying users / Some Chinese have a habit of paying for anything.